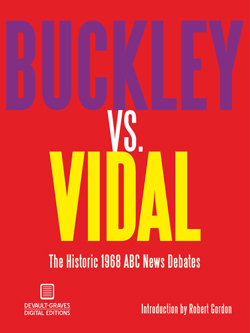 Conservative icon William F. Buckley Jr. and liberal author Gore Vidal exploded onto the political scene during the presidential conventions of 1968 when they debated 11 times on ABC News as part of its convention coverage. Their debates were fiery and combative and they infamously blew up at each other during their penultimate debate in Chicago. The debates, the subject of the new documentary film "Best of Enemies," have not been shown or transcribed in their entirety since the original airings in 1968. Devault-Graves Digital Editions exclusively brings you the complete, uncensored transcripts in all their highly readable glory. The book also features an eloquent and informative introduction by one of the directors of "Best of Enemies," author Robert Gordon. Buy now from Devault-Graves Digital Editions.